A KOREAN FACE MASK MADE WITH EGG WHITES! Being of Korean heritage, it always delights me when I find another great Korean skin care product to share with you. Today is no exception. I bring you the SKINFOOD EGG WHITE PORE MASK. It feels like you are applying “white clay” to your skin. It’s thick and rich, and a little goes a long way with this affordable face mask. It has really shrunken my pores and I don’t have any blackheads that you can see. My complexion is smooth and clear. 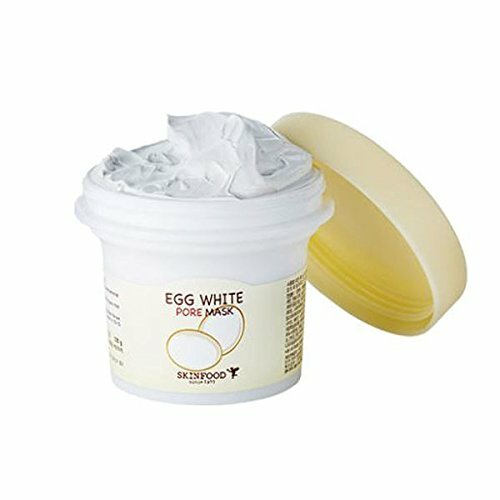 A dedicated, pore-refining mask with egg whites that tightens enlarged pores and lessens their appearance, and regulates excessive sebum. Egg whites (albumen), is one of nature’s highest quality protein sources. Contains niacin (Vitamin B3), riboflavin (Vitamin B2), selenium, magnesium, calcium, phosphorus, potassium, and a complete amino acid profile. Egg whites are a deep cleanser for congested skin. It deeply penetrates pores as it removes pore-clogging oil and dead skin cells along with blackheads. Egg white stimulates the growth of collagen cells, improving your skin’s elasticity and resilience. After cleansing, apply to your face except the eye and mouth area. Wash off with lukewarm water in 10-15 minutes. I like the SKINFOOD EGG WHITE PORE MASK. It really cleans your face and gives it that fresh feeling. I recommend this product for those with oily skin and acne as it is really super good at getting the impurities out of your skin, and leaving it smoother. Will you try it? It both affordable (Under $10) and effective. Thank you for spending time with me today. Please share this blog on social media. Coming up next on The Badass Writer: The latest in celebrity skincare with Robin McGraw, a book review on Frozen Butterflies and a peek inside Self-Made Cosmetics. Stay with us!